We made a sweet discovery yesterday! Allergies had gotten the best of me on Sunday night, and Monday morning I arrived at the barn exhausted. My daughter was still in her pajamas, so my mom tucked us both into bed. Ahhh, the rare opportunity of being both mother and daughter. 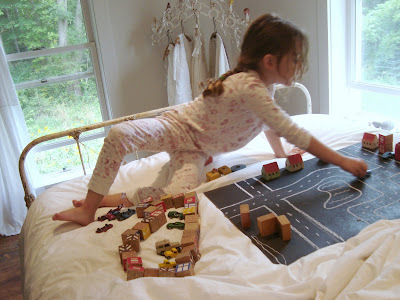 My girl was ready for action long before I was, and gathered a bunch of blocks and little cars to play with amidst the hills and valleys of the blankets. My mother recognized the need for a sturdy play surface and went to find a tray of sorts. A lot of chalkboard projects are happening in the barn kitchen, so she happened to have a portable black board on hand... even better than a tray! Soon we had roads, a pond... an entire village was built. I suddenly got my second wind, and the perfect "stuck in bed-boredom-buster-board" was born! Think of all the open-ended play opportunities this one tool will afford. We're getting out the farm animals next time. I'll make certain to have one on hand before the cold and flu season hits. You can buy a ready-made chalkboard or create your own with a light-weight piece of wood covered in chalkboard paint. Don't you think these would make wonderful gifts with a little basket of vehicles? Ooooo! I sensing an awesome and affordable Christmas gift for all the nieces and nephews! I would say that it's a fantastic idea! A must have for me...Oh, I mean my children. They would spend hours with something like this. Hope you are feeling better. You are so smart! What a great idea! Black acrylic paint works well too - you just have to use a wet cloth to erase the chalk. Oh this is a great idea!! Definitely going on the list of things to make - might even be able to tempt my husband in to making this one!! What a great idea. I also love the snippets of the room that we get to see in these photos! I'd love to see the whole space! -Thanks, Lisa, for the black acrylic paint tip. -Homemoma: yeah, good for playing anytime, not just bed. -Wendy: I'm planning another barn tour some time in the next week or so. In the meantime, you can check the link to Restoration Barn( in the side bar or referred to in the first few lines of this post) for more photos. i love the board idea. but what i REALLY love is your mom taking such good care of the two of you. can i borrow her? please. That is a wonderful idea. My 4yo is lately obsessed with building an animal city. Or getting pets. Or trapping lizards. Or making a robot. Or growing a garden. Actually, it's hard to keep up with his obsessions. A chalkboard like this could serve so many uses. A basket of vehicles and some chalk. Great gift idea! Hope you feel better. Chalk dust in bed? Ugh. anonymous- I can't imagine lots of chalk dust in bed being pleasant. We had the board on top of the covers, and any serious erasing could have happened off of the bed. Frankly, we were having so much fun that we didn't notice dust one bit! Thanks, Jojoebi!! I love good tips! So sorry to hear about your allergies. This project reminds me so much of when my children were younger. It is just the sort of thing that we would do. maya, you are so darned cute and inventive! what a great idea! you seem to find inspiration everywhere....even when you are in bed! i love this idea!! that is an awesome idea - I think my 11 year old would love it too! She's currently in bed with a cold and adores to spend hours drawing - she could draw her village and set to playing with her little sylvanian critters, adding and erasing what she needs. Thanks for the inspiration! And I hope your allergies improve. They are so exhausting. It is a really good idea! I wonder if my niece would like it? Maybe I'll have to find out! LOVE this idea! 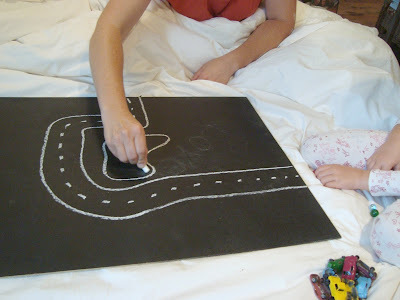 Put on a coat of magnetic paint before the chalkboard and you have even more play options! Thanks for the great idea! I even have all these supplies on hand! I did something similar for a road trip. I used an old breakfast in bed tray. It's perfect in the car, because my son could open it up over his lap, plus none of the items fell off because the tray has a lip surrounding it. My little guy had a blast making tracks for his cars, playing tic tac toe or hang man, making silly faces and messages. Great for holding his toys and gadgets too. I love this idea, where did you get your little wooden houses? 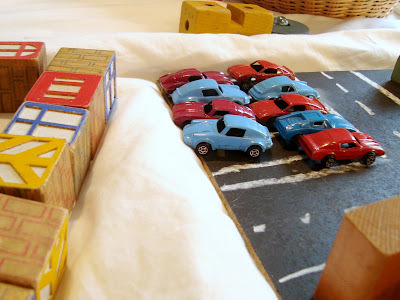 breezy babies: the little houses are some of the only things we have left from my grandparents nursery school... they ran it for 50 years and it's huge part of our family history. Thanks for noticing them! Fantastic idea on the chalk board eraser! I have a whole chalk board wall for 3 years and haven't had an eraser the whole time!